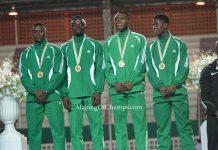 Nigeria’s Americans fail to get 100m, 400m & 110m Hurdles COMMONWEALTH Medals – Why did we recruit them again? 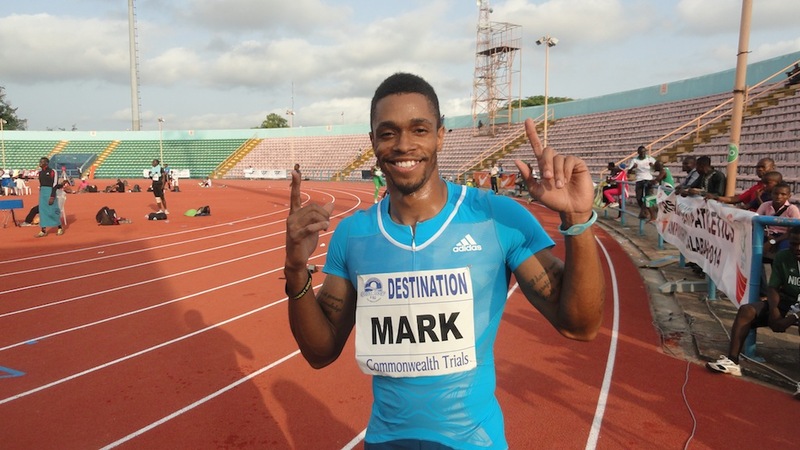 Nigeria’s hopes of securing a Commonwealth medal in the men’s 100m ended last night at Hampden Park in Glasgow, as the country’s sole finalist Mark Jelks finished in fifth place in 10.17s. The title was won by Jamaica’s Kemar Bailey-Cole who stormed to gold in 10.00s flat and was closely followed by England’s Adam Gemili in 10.10s, to the clear delight of himself and the home crowd, while another Jamaican, Nickel Ashmeade got the bronze in 10.12s. This is Jelk’s first outing for Nigeria, having recently switched allegiance from the US and though the 30-year-old was hoping for a podium finish, his efforts are nonetheless commendable, going by the fact that he was the only African in the final that boasted of three Jamaicans, amongst others. 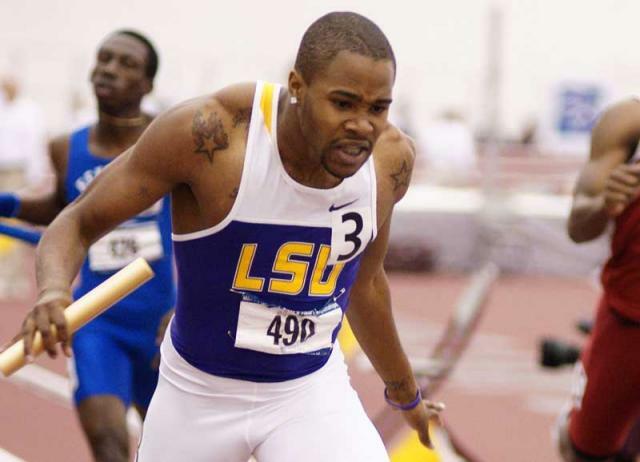 Jelks, who emerged National Champion at the Nigeria’s trials earlier this year was entered to the 100m alongside another newly acquired American athlete, 33-year-old Monzavous Edwards who finished 2nd in the trials, and Ogho-Oghene Egwero, 3rd at the trials. The duo however fell by the wayside, with Egwero finishing 8th in his semi-final with 10.40s while Edwards didn’t fare much better, trailing in 7th in his semi with 10.30s. 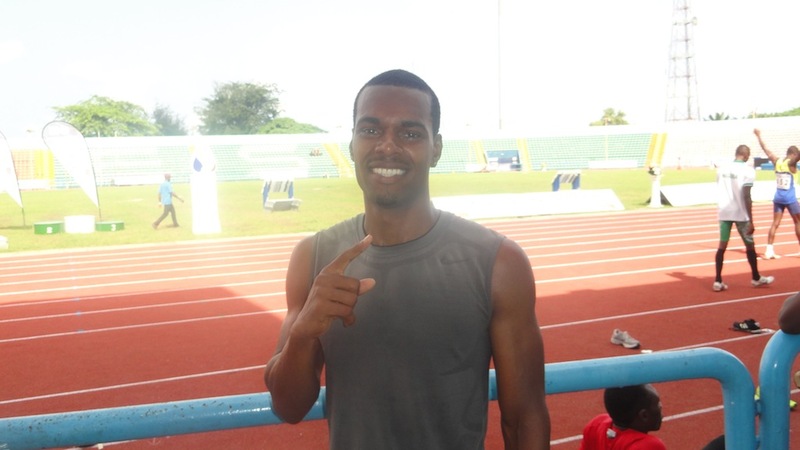 Jelks had qualified for the final as one of the fastest losers in the semis where he posted a time of 10.13s. In the absence of some of the tournament favourites and leading names such as Trinidad and Tobago’s Richard Thompson, No. 1 in the Commonwealth this year with 9.82s but failed to progress to the final, and Jamaica’s Nesta Carter (SB 9.98s), Asafa Powell, Yohan Blake and the big man himself Usain Bolt, one would have expected the newly converted athletes to have at least made an impact, going by the controversy that has trailed their acquisition of the Nigerian passport and their subsequent selection to Team Nigeria. 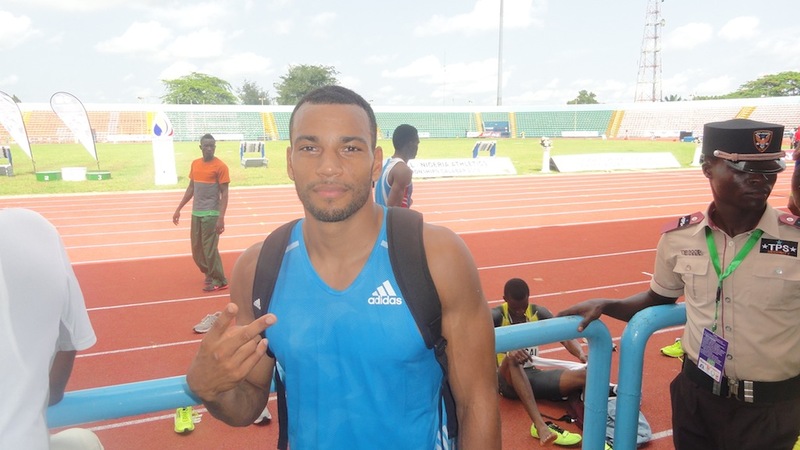 One of them, Robert Simmons, did not even need to appear at the Nigerian Trials to suit up for his new country yesterday in the 400 metres, thus calling the whole selection process into question. Incidentally, he failed to finish his 400m heat, pulling up half way through due to injury! 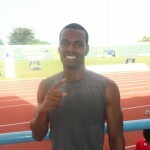 Robbert Simmons, formerly of Team USA, now of Team Nigeria! In the 110m Hurdles on Tuesday morning, another American recruit, 28-year-old Tyron Akins, crashed out of the 110m Hurdles after finishing 4th in Heat 2 in a time of 13.75s. Akins won the Nigerian title at the trials in June, and at his best about 6 years ago he was a 13.25s runner. Former Team GB athlete Alex Al-Ameen, who qualifies to for the Green Passport by virtue of his Nigerian father, just scraped through to the final, qualifying as one of the fastest loser’s from Heat 1 in a time of 13.71s. As we predicted yesterday in our analysis, Akins and Al-Ameen were likely competing for one fastest loser spot, and that proved to be the case. Though Al-Ameen’s chances of making an impact in the final are slim to none, the 25-year-old should be encouraged as an athlete who COULD improve for Team Nigeria over the next 5 years! All this then begets the question we asked at the start of the week – were any of the recruited Americans really good enough to win Commonwealth GOLD in the first place? And if they are not good enough at THIS LEVEL, what on earth will happen when Team USA is in the mix, and Jamaica’s A-team return for the World Championships and Olympics in the next 2 years? Does Nigeria really need to adopt this strategy of recruiting older American athletes rather than developing our own future stars? Have they really justified their inclusion into the team? Should we not have allowed the likes of 22-year old Seye Ogunlewe, Nigeria’s best young sprint talent, the opportunity to experience individual 100m sprinting at the Commonwealth Games, while grooming him for years to come? The jury is out on this one, but they have very nearly reached a verdict already, after just THREE days of Athletics action at the Games. The last of Nigeria’s American recruits is Nichole Denby, who competes in the 100m Hurdles on Thursday. Can she fare any better? We won’t have long to wait to find out. Yesterday I was so proud to be a nigerian again, as a big track and field fan, it was nice to see nigerian men and women in the final of the 100m. Since the emergence of blessing okagbare the nigerian women have always made us proud. But the nigerian men have failed apart from olusoji fasuba winning the 60m in the world indoors in 2008, I can’t remember the last nigerian man to come close to fifth in a sprint final. Mark Jelks offers consistency and experience something obinna metu and ogho have not been able to master. The truth is if the nigerian male athletes are good enough, the federation would not need to recruit Americans. I think the problem starts from the training, coaches and facilities. If this was good then things will be better, in response to seye ogunlewe, he’s the future but not experienced enough, his biggest competition is the BUCS championship, he can improve more if he goes to America to go and train, blessing trains with john smith, in her group she trains regularly with champions like Carmelita jeter and murielle ahoure, which improves her confidence and skills. Thanks for your comment! Seye is already 22 – what is Commonwealth Games for him, but to get that experience you say he doesn’t have? Why do we recruit a 33-year-old American who cannot make the Commonwealth 100m final, when a 22-yr-old Nigeria could have given the same performance, yet also earned that invaluable experience for the future? As for Jelks, he is already 30, so how much longer is he going to be around for? 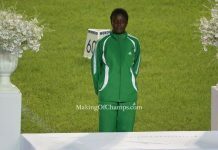 We share your excitement and pride of being Nigerian thanks to Blessing’s spectacular victory yesterday, and she is living proof that CHAMPIONS are MADE and not BOUGHT, and they are not made overnight – she’s been a world class sprinter for over 4 years before this first global GOLD! Agreed, we should support anyone wearing the green-white-green. Agreeing with, and not speaking out against a policy that is killing Nigerian athletics further is another matter. Yes even Seye is a product of British training, that is why we need to institute the same level of training in Nigeria, the same way the Jamaicans have done over the last 15 years! 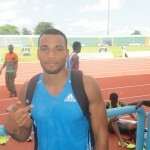 Great to hear that Seye will appear in the 200m. Will be interesting to see how we do in the 4x100m – let’s see! This question personifies what is wrong with the Nigerian system. 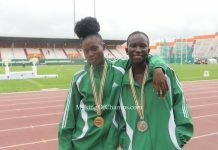 These athletes (who by the way are better than what we currently have) could surely have worked for and made the American team (some at least) but then decided to compete for a country they had never been to before just because someone in their ancestry is Nigerian and this is how we appreciate them? Even if the message being passed across was to encourage them to work harder, what happened to commendation before criticism? Why are we so short-term minded saying that they didn’t win commonwealth gold when there are more tournaments coming up. This topic shouldn’t even be up for debate because you don’t know the psychological damage seeing this article with such a title will do to our new messiahs. All we had before Regina George came was Blessing Okagbare covering the incompetence of the Nigerian Athletics Association with her raw talent and now we’ve gotten these guys you’re so quick to criticise them? That’s so wrong. And if they went on to compete for other countries, we’ll be the first to call them ‘runaway athletes. I’m so sick and tired of our close-mindedness and our irrational thinking. Reason our country is the shambles that it is. thanks for your comment. I understand how you feel that this may be difficult for some of the athletes in question to read. But the message here is not about them, it is about a nation mortgaging its future in a sport that we can dominate globally, for short-term, misplaced incentives. Not sure why you think any of these athletes can represent Team USA, or why you think they would be here if they could. Look closely at what is happening to the athletes in your country, instead of calling these guys ‘messiahs’. Look very closely. Do you think they would be better than what we have at home, if the home-based athletes are given everything they need to succeed? The purpose of this blog is to LIFT THE LID on how CHAMPIONS are MADE. Not bought, but MADE. Nigeria is NOT in shambles because of what we’ve written here. But it may very well stay in shambles in Athletics if you choose not to see what is really happening here. We’re trying to show you the TRUTH of the situation, and hopefully you’ll be patient enough to see it as clear as day soon! Thank you, Hafiz. What happened to supporting anyone flying our flag? SOme of these folks would still compete over the next days and in the AFrican championships. Imagine trying to damage their psyche with questions like this? Yes! Let’s support anyone donning the green-white-green! I wouldn’t worry too much about demoralising them though – they’re grown men and they will be just fine at the African Championships! At least at that level, I expect them all to win medals! I am with Bambostic on this issue. We appreciate the fact that Jelks made it to the finals and competed well. We recruited a lot of them to get results; we are not getting it. The American athletics team is the most highly contested. Have you all seen their world champs or Olympics qualifiers??? The athlete that comes last in the 100m might even run sub 10. Please we need to build our own local athletes from their tender age. The set of athletes that went to Oregon last week for the world junior champs… not old 30+ athletes. Please note that I would have been in support if they wear in their early twenties and not past their peak. Please let us stamp our feet on the ground and not accept these old athletes that are not contributing much. Thanks for your comment – you’re right that if they are younger it may make more sense, as it shows they are prepared to give the best years of their careers to Nigeria, not just collect a retirement check! Dominique Duncan for example – she’s 24 and going in the 200m for Nigeria tonight. Let’s see what she can do! I must say I am with MoC on this topic. These athletes have not contributed as expected. Most of these athletes are past their prime and for how many years are they expected compete? At 30+? Nigeria at this point cannot be looking for quick success; not with all that is wrong. We need to build our athletes like we have done with blessing okagbare. Okagbare did not become a star overnight (certainly didn’t start in her 30s). I remembered when she came to the beijing Olympics as an unknown… look at where she is today. With the success we have had with blessing, we should have invested in more athletes and sponsored them to schools abroad while also improving our infrastructures in Nigeria so that we do not need to send them abroad anymore. This new tactics of recruiting Americans (ofcourse with Nigerian lineage) is not the way forward. I am in support of the way forward. In support of the future. Well said. It has taken Blessing SIX years to get herself in this position, where she is one of the world’s best sprinters, since breaking out with Bronze in the Long Jump at the Beijing Olympics. She is living proof of how CHAMPIONS are MADE!